Sub-zero temperatures and freezing winter winds are notorious for moving our workouts indoors. And while we try to cling to the silver lining of gym time — at least I can feel my toes! — there’s nothing more soul-crushing for fitness junkies than relying on the dreaded treadmill for a traditional bout of cardio. But don’t be so quick to give in to that human hamster wheel. 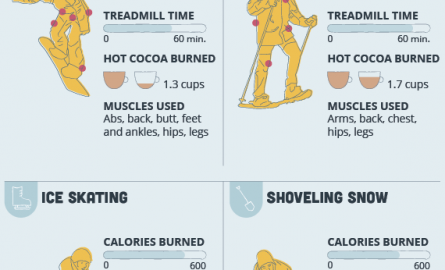 There are plenty of ways to get your sweat on in the winter elements — and there are even unique benefits of doing so. Check out these outdoor activities that beat the treadmill every day of the week! Graphics by Jan Diehm and Alissa Scheller for The Huffington Post.